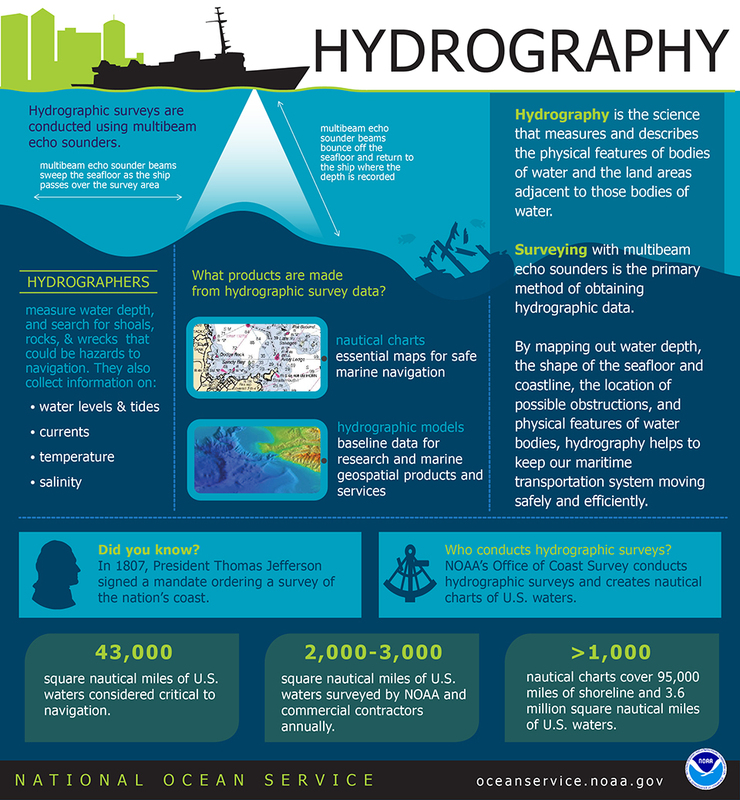 Home Ocean Facts What is hydrography? A hydrographer studies data collected by multibeam sonar to generate a 3-D image of the Kachemak Bay floor. Hydrography is the science that measures and describes the physical features of the navigable portion of the Earth's surface and adjoining coastal areas. Hydrographic surveyors study these bodies of water to see what the "floor" looks like. NOAA's Office of Coast Survey conducts hydrographic surveys to measure the depth and bottom configuration of water bodies. That data is used to update nautical charts and develop hydrographic models. This information is vital to navigating the ocean and our nation's waterways. Hydrographical surveys are also used in NOAA's Integrated Ocean and Coast Mapping program, providing information for a number of purposes, including seafloor structural construction, laying pipelines and cables, dredging, anchoring and understanding fish habitats. Hydrography is the science that measures and describes the physical features of bodies of water and the land areas adjacent to those bodies of water. Surveying with multibeam echo sounders is the primary method of obtaining hydrographic data. By mapping out water depth, the shape of the seafloor and coastline, the location of possible obstructions and physical features of water bodies, hydrography helps to keep our maritime transportation system moving safely and efficiently. Multibeam echo sounder beams sweep the seafloor as the ship passes over the survey area. Multibeam echo sounder beams bounce off the seafloor and return to the ship where the depth is recorded. What products are made from hydrographic survey data? Nautical charts: essential maps for safe marine navigation. Hydrographic models: baseline data for research and marine geospatial products and services. NOAA's Office of Coast Survey conducts hydrographic surveys and creates nautical charts of U.S. waters. In 1807, President Thomas Jefferson signed a mandate ordering a survey of nation's coast. 43,000 square nautical miles of U.S. waters considered critical to navigation. 2,000 - 3,000 square nautical miles of U.S. waters surveyed by NOAA and commercial contractors annually. >1,000 nautical charts cover 95,000 miles of shoreline and 3.4 million square natical miles of U.S. waters.